Neon is an abundant element in the atmosphere, but it is much scarcer on Earth due to its chemical inertness. 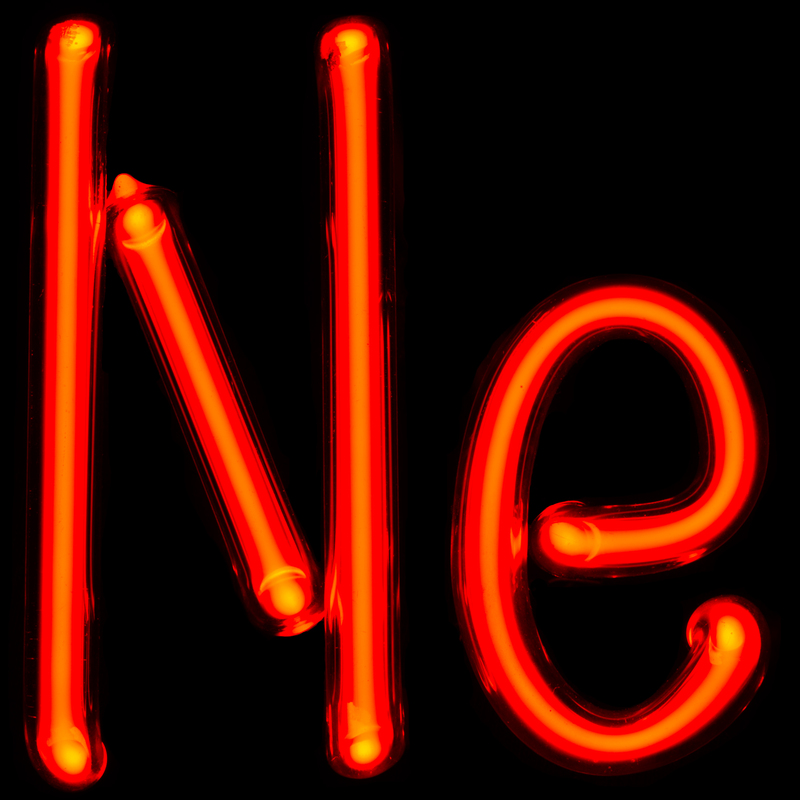 Discovered in 1898, early studies of neon contributed greatly to our basic understanding of the nature of atoms, giving us our first observations of isotopes of stable atoms. One might, therefore expect that neon would be among the elements present in the Cambridge Structural Database (CSD). … … However, in preparing a review to celebrate the CSD’s 50th anniversary it became apparent that despite these structures containing a total of 94 different elements … neon was not among their number. A chance encounter at a conference presented an opportunity to rectify what we thought was a remarkable omission. Why do I find this exciting? Well, for a start, the article was published in Chemical Communications, a journal for swift communication of important results. I was around when the journal was born, as a new and rather awed member of the Editorial Board for Faraday Transactions – another journal published by the Royal Society of Chemistry. Great were the arguments for producing new journals and changing the names of old ones, and I entered enthusiastically into the debates – usually on the losing side. Even at school I found the so-called “inert” elements intriguing – atoms that wouldn’t, and seemingly couldn’t, react with others. Then, in 1962, while I was still an undergraduate, came the astonishing news that someone had managed to produce a compound of xenon with fluorine. A part of the appeal to me is in the recall of that childhood fascination with the inert gases. Another is the beautiful picture that the authors produced of neon atoms forming neat hexagons within a metallic framework. But the real revelation here is in that little sentence “A chance encounter at a conference presented an opportunity to rectify what we thought was a remarkable omission.” “A chance encounter at a conference” reveals the role of chatting, swapping ideas, and looking for chances (which, to paraphrase Louis Pasteur, favour the prepared mind). But hidden in that sentence is another feature of scientific discovery – that it is often about play. The pursuit of science is, or should be, fun, and these authors have clearly had fun in “rectifying an omission”, filling a gap in our knowledge, producing something new, interesting and fun. The justifications may be about practicality and potential uses, but this is not why we do science. Nor should it be.